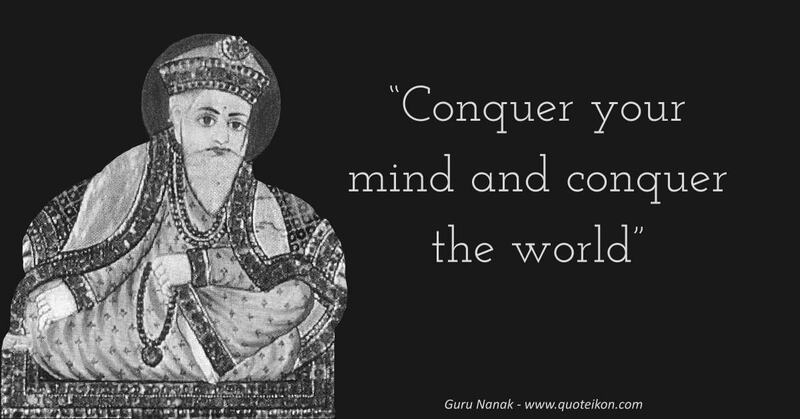 Quotes about Guru Nanak: The eminent historian Dr H.R. 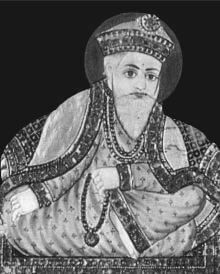 Gupta described him with the greatest respect: "Nanak's faith was simple and sublime. It was the life lived. His religion was not a system of philosophy like Hinduism. It was a discipline, a way of life, a force, which connected one Sikh with another as well as with the Guru"
The Sanskrit scholar Shri Shastriji spoke glowingly when he said: "He gave teachings of spiritual perfection, valid for all mankind. To follow these teachings is to realize good for all humanity and the unity of all humanity and the unity of the individual soul with the universal Soul"
Author H.S. Singha gave this enlightened description of him: "Sikhism does not subscribe to the theory of incarnation or the concept of prophethood. But it has a pivotal concept of Guru. He is not an incarnation of God, not even a prophet. He is an illumined soul"
"Conquer your mind and conquer the world"
"The impurity of the mind is greed, and the impurity of the tongue is falsehood. The impurity of the ears is to listen to the slander of others"
"Make compassion the cotton, contentment the thread, modesty the knot and truth the twist. This is the sacred thread of the soul"
"Even Kings and emperors with heaps of wealth and vast dominion cannot compare with an ant filled with the love of God"
"Speak only that which will bring you honour"
"The world is a drama, staged in a dream"
"I don't die - He who is merged with the omnipresent is never gone"
"Death would not be called bad, O people, if one knew how to truly die"
"Before becoming a Muslim, a Hindu, a Sikh or a Christian, let's become a Human first"
"I am neither a child, a young man, nor an ancient; nor am I of any caste"